All Time Low has always known many opponents, but even more fans. Throughout the years, the band has made a huge name for themselves and played many great tours and festivals. Here in Belgium, they've already played all major festivals such as Pukkelpop and Rock Werchter, but they also still play the real punk festivals such as the Warped Tour in the USA and Groezrock in Belgium. 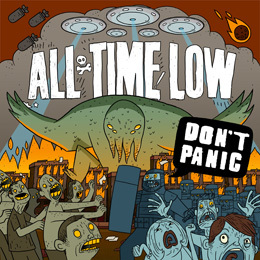 Don't Panic is the name of the new All Time Low full-length and from the first song on, The Reckless And The Brave, it's already obvious that we're in a for a pop punk hit parade again. After having listened to the songs just once, they already stick to the mind. The most remarkable thing about Don't Panic, is that it's the fastest and hardest album released by the four guys in years. Just give songs such as So Long Soldier a listen and you'll definitely understand my point of view. It must be the fastest song ever released by All Time Low. If you want to be enchanted by earworms other than those from Taylor Swift or One Direction, you better give the new All Time Low record a listen.